Whitening for life is here!!! Whitening for life for $135 !!! There is one condition: You must remain an active patient, meaning at least one cleaning every six months. You may not participate if you have any active untreated periodontal disease, or untreated tooth decay, as tooth bleaching could be harmful if these conditions exist. Remember, tooth bleaching does not whiten existing crowns or bridges or bonding. Whitening for life will be deactivated if you spend over six months to come back to your cleaning. 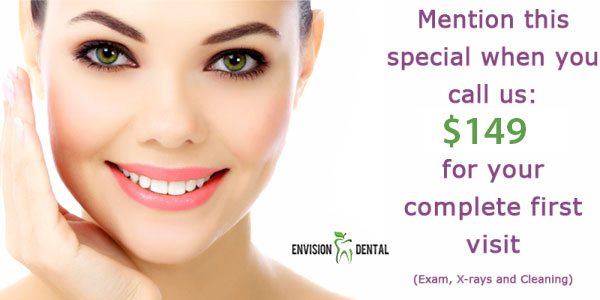 $149 Complete set of x-rays (D0210), exam (D0150) and a healthy mouth cleaning (Prophylaxis D1110).